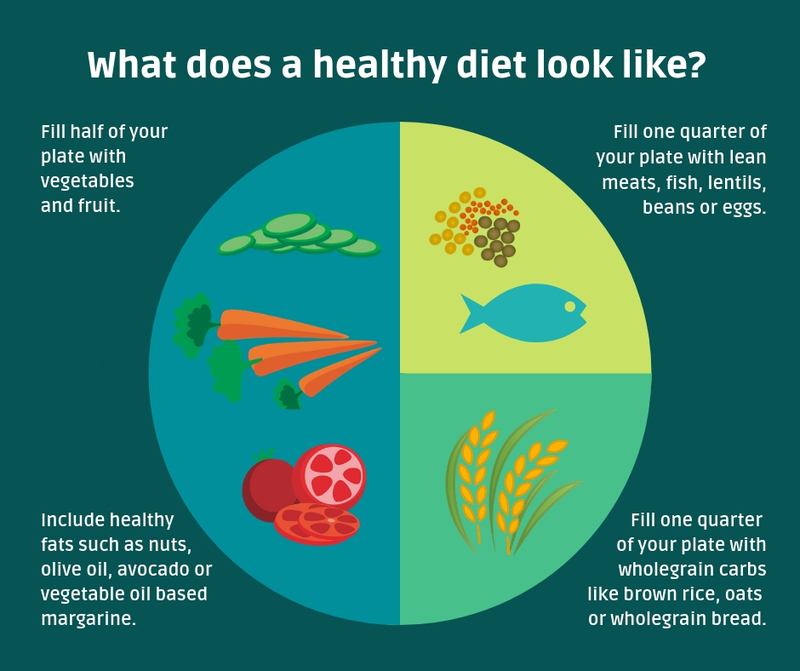 Do you ever find yourself confused about what foods make up a healthy diet? You are not alone! Every week the newspaper headlines showcase the latest ‘superfood’ that you must eat to lose weight or the food you need to avoid to live longer. One week you are being told to avoid gluten to lose weight, the next week it’s drinking 10 cups of green tea a day. So, what foods should be included in a healthy lifestyle? Despite the ever changing newspaper headlines, the basic principles of healthy eating have always been the same. While ‘superfood’ claims are made on the basis of one small research study, the following 6 tips are supported by a huge amount of scientific research which links this approach to eating with a reduced risk of developing many diseases including heart disease and cancers. At LEAST five a day, the more the better! Such as oats, rye, brown rice and wholegrain bread, pasta and noodles. Including at least one portion a week of oily fish such as salmon or sardines. Eat foods such as cheese, cakes, biscuits, red meat, butter and processed meat occasionally. Choose lower fat options such as lean meat, reduced fat milk and yogurts. Eat fish, nuts, avocados and vegetable oil based margarine. Use olive oil for salad dressings and rapeseed or sunflower oil for cooking. Salt is often hidden in processed foods (such as tinned soup, cereals and ready meals) so try to cook when possible and read the labels. While the six tips above are useful, it can still be a lot to think about when deciding what to eat. The following diagram is a guide to building a healthy meal that you can adjust to the time of day and the foods you enjoy eating. Can I lose weight by eating this way? Yes! In addition to all the health benefits, this approach to eating can help with weight loss. By filling your plate according to the above tips you will feel full and satisfied, reducing your likelihood of overeating. Following this approach 80% of the time and choosing other foods you enjoy the other 20% will help you to lose weight. Most importantly, because it includes a wide variety of foods and is easy to follow, it is an approach that can be followed for life meaning that you will not re-gain the weight! No more counting calories or points and restricting certain foods. Surely there is a catch? Eating too much of any foods, even the foods included in this healthy eating approach, will cause weight gain. Therefore, it is important to make sure you have your portion sizes in check. Next month I will give some simple tips to getting your portion sizes right – without the need for weighing scales or calculations! Fiona is a HCPC registered dietitian and is passionate about helping people to make lifelong, enjoyable lifestyle changes and to develop a healthy relationship with food. Her qualifications include BSc (Hons) Sport science, Physiology and Nutrition, MSc Dietetics & Level 2 gym instructor and she is currently undertaking a PhD in nutrition and exercise. The secret to weight loss? Stop dieting!